In Your Face Gene Simmons, Mine’s Blue! Since this area seems to be a haven for Blue Tongue Lizards, I thought I’d write a little bit about them for the readers in other countries who may not be too familiar with these very cool reptiles. I come across them everywhere here – not just the backyard. When I walk Cindy (the dog) I see them poking out of drains basking in the sun, crossing the road and just generally hanging around. They appear to be so used to humans and other animals I can always get a really good look at them when I pass. These lizards are slow moving and quite friendly. They are likely to let you get really close. I wouldn’t advise picking them up though unless they are really familiar with you, because if they are scared they do have a nasty bite, latching on and not letting go. Eastern Blue Tongue Lizard – These dwell in South East of Oz and are the kind that live around here. They grow to about 30cm in length (not counting the tail). They are grey with brown stripes across their back. Northern Blue-tongued Skink – These guys live on the savannahs of the tropical regions of Oz. Western Blue-tongued Skink – This one is listed as a vulnerable species. Central Blue-tongued Skink– Another vulnerable species. 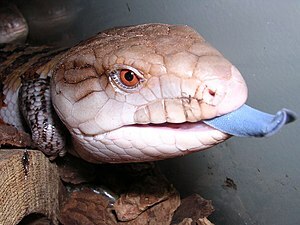 Blotched Blue Tongue – From the Southwest of Oz, lives in highland areas. They are dark brown with light coloured splotches across the back. Shingleback – Found west of the Great Dividing Range. It has a short, stumpy tail and large rough scales. Pygmy Blue-tongue Skink– Only grows to about 90mm. They live within a very small area north of Adelaide and are listed as an endangered species. Whatever species, the most noticeable feature is, of course, their blue tongue. Like all reptiles they are ectothermic which is why you see them sunning themselves during the mornings. When it’s cold they stay inside because they need a body temperature of 30 to 35 degrees C to be active. They love to eat snails and slugs but will eat whatever they can get hold of, including dog food. For most of the year they like to live alone, but during the mating season (September to November) the males pursue the females, which is why we see three-legged Louis (he is so cute, his little stump does the walking action too) making his trips up to the old barbecue to visit Lisa. Mating seems like a rough old process. Many females carry scars from the male’s teeth during mating. Their babies are born 3 to 5 months after mating. They are born live (not eggs) and have to look after themselves right from the start, beginning with eating the placenta, and go off to discover the great big world within a few days of being born. 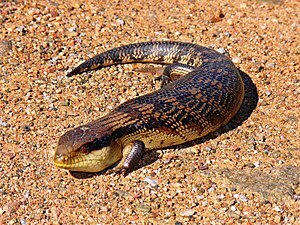 The Eastern Blue Tongue can have up to 25 babies at once and they breed annually where other species only breed on alternate years. Blue Tongues can live for many years, up to 30 and like other lizards can drop their tails to avoid, daze and confuse predators. Cars – they love to lie on the road’s warm surface and tend not to move out of the way of cars. Snail baits – cos they love to eat snails. Lawnmowers – they hide in long grass and again tend not to get out of the way when the mower comes near them. Cats and dogs – need I say more? 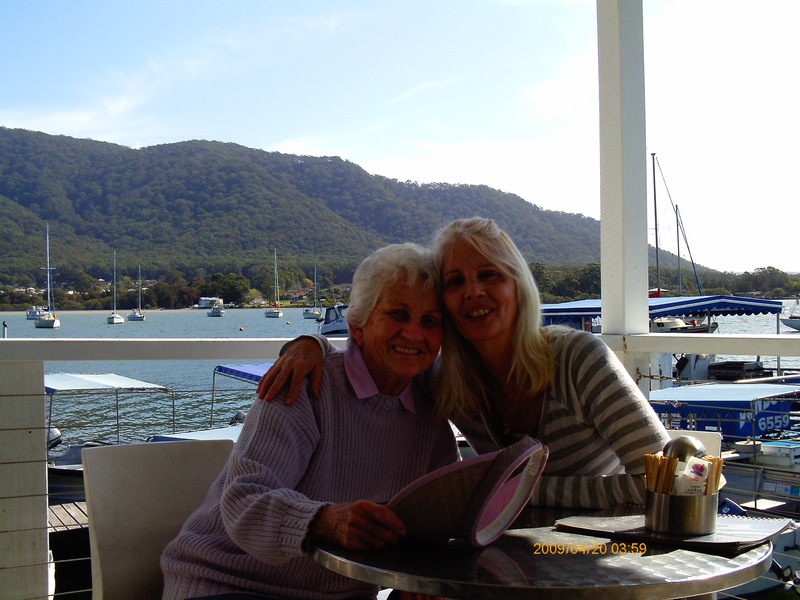 Other predators are eagles, poisonous snakes and large goannas. So, there’s just a little bit about these excellent creatures. There’s lots of info around if you want to find out more. I love them.